Preston, H.B. 1912. A catalogue of the Asiatic naiades in the collection of the Indian Museum, Calcutta, with descriptions of new species. Records of the Indian Museum 7: 279-308. ‘Heude’ Preston, 1912, Rec. Ind. Mus. : 284. Simpson, 1900, Proc. U.S. Nat. Mus. : 639. Preston, 1912, Rec. Ind. Mus. : 284. Haas, 1920, Conch. Cab. : 297. Haas, 1969, Das Tierreich: 382. ‘Heude’ Preston, 1912, Rec. Ind. Mus. : 283. Paetel, 1890, Cat. Conch.-Samml. : 183. Simpson, 1914, Descr. Cat. Naiades: 405. ‘Drouet’ Preston, 1912, Rec. Ind. Mus. : 294. ‘Nevill MS’ Preston, 1912, Rec. Ind. Mus. : 306. ‘Nevill MS’ Preston, 1915, Fauna Brit. India: 190, text fig. 24. Preston, 1912, Rec. Ind. Mus. : 305. Preston, 1915, Fauna Brit. India: 187, text fig. 21. Preston, 1915, Fauna Brit. India: 190, text fig. 22. Lamellidens marginalis var. sawaddyensis Preston, 1912. Preston, 1915, Fauna Brit. India: 185, text fig. 20. Lamellidens marginalis var. sublamellatus Preston, 1912. ‘Nevill, MS’ Preston, 1912, Rec. Ind. Mus. : 305. Preston, 1915, Fauna Brit. India: 181, text fig. 19. Margarita (Unio) crassiamus Preston, 1912. ‘Lea’ Preston, 1912, Rec. Ind. Mus. : 286. Simpson, 1900, Proc. U.S. Nat. Mus. : 836. Preston, 1912, Rec. Ind. Mus. : 295. Nodularia (s.s.) chaudhurii Preston, 1912. Preston, 1912, Rec. Ind. Mus. : 290. Preston, 1915, Fauna Brit. India: 140, text fig. 7. Nodularia (s.s.) pecten Preston, 1912. Preston, 1912, Rec. Ind. Mus. : 292, pl. 8, figs. 3-4. Nodularia (s.s.) theobaldi Preston, 1912. ‘Nevill, MS’ Preston, 1912, Rec. Ind. Mus. : 292. Preston, 1915, Fauna Brit. India: 143, text fig. 8. Parreysia (Parreysia) annandalei Preston, 1912. Preston, 1915, Fauna Brit. India: 173, text fig. 18. Parreysia (s.s.) daccaensis Preston, 1912. Preston, 1912, Rec. Ind. Mus. : 300. Preston, 1915, Fauna Brit. India: 165, text fig. 16. Parreysia (s.s.) pernodulosa Preston, 1912. Preston, 1915, Fauna Brit. India: 164, text fig. 15. Parreysia (s.s.) favidens var. irridula Preston, 1912. ‘Benson’ Preston, 1912, Rec. Ind. Mus. : 299. Parreysia favidens var. assamensis Preston, 1912. ‘Nevill, MS’ Preston, 1912, Rec. Ind. Mus. : 299. ‘Nevill MS’ Preston, 1915, Fauna Brit. India: 161, text fig. 12. Pseudodon (Trigonodon) crebristriatus var. curvata Preston, 1912. Preston, 1915, Fauna Brit. India: 152, text fig. 9. Trapezoideus foliaceus var. zayleymanensis Preston, 1912. ‘Nevill, MS’ Preston, 1912, Rec. Ind. Mus. : 307. ‘Nevill MS’ Preston, 1915, Fauna Brit. India: 194. Type(s): SYNTYPE SMF_3615, Zayleyman, Ob. Birma. Preston, 1912, Rec. Ind. Mus. : 286, pl. 8, figs. 1-2. ‘Lea’ Preston, 1912, Rec. Ind. Mus. : 291. Lea, 1870, Synopsis Fam. Naiades: 63. Preston, 1912, Rec. Ind. Mus. : 288. Preston, 1912, Rec. Ind. Mus. : 287, pl. 8, figs. 5-6. Preston, 1908, Rec. Ind. Mus. : 47. Preston, 1912, Rec. Ind. Mus. : 293. Preston, 1915, Fauna Brit. India: 148. Anodonta woodiana (Lea). — Preston (1912: 282). Arconaia lanceolata (Lea). — Preston (1912: 307). Chamberlainia hainesiana (Lea). — Preston (1912: 280). Cristaria (Pletholophus) reiniana (von Martens). — Preston (1912: 281). Cristaria (Pletholophus) swinhoei (H. Adams). — Preston (1912: 281). Cristaria (s.s.) bellua (Morelet). — Preston (1912: 281). Cristaria (s.s.) herculea (Middendorff). — Preston (1912: 281). Cristaria (s.s.) plicata (Leach, 1814). — Preston (1912: 280). Dalliella insularis (Drouet). — Preston (1912: 294). Dalliella purpurea (Valenciennes). — Preston (1912: 294). Dalliella subcrassa (Lea). — Preston (1912: 294). Gabilliotia [sic] euphratica (Bourguignat). — Preston (1912: 284). Hyriopsis bialatus Simpson. — Preston (1912: 279). Hyriopsis cumingii (Lea). — Preston (1912: 279). Hyriopsis myersianus (Lea). — Preston (1912: 280). Hyriopsis schlegeli (von Martens). — Preston (1912: 280). Lamellidens (s.s.) mainwaringi ‘Nevill MS.’ sp. n. — Preston (1912: 306). Lamellidens (s.s.) marginalis (Lamarck). — Preston (1912: 302). Lamellidens (s.s.) marginalis var. candaharicus (Hutton). — Preston (1912: 303). Lamellidens (s.s.) marginalis var. consobrinus (Lea). — Preston (1912: 304). Lamellidens (s.s.) marginalis var. corrianus (Lea). — Preston (1912: 304). Lamellidens (s.s.) marginalis var. generosus Gould. — Preston (1912: 304). Lamellidens (s.s.) marginalis var. jenkinsianus (Benson). — Preston (1912: 305). Lamellidens (s.s.) marginalis var. lamellatus (Lea). — Preston (1912: 304). Lamellidens (s.s.) marginalis var. obesus (Hanley & Theobald). — Preston (1912: 303). Lamellidens (s.s.) marginalis var. sawaddyensis (Nevill, MS.) var. n. — Preston (1912: 305). Lamellidens (s.s.) marginalis var. scutum Sowerby. — Preston (1912: 304). Lamellidens (s.s.) marginalis var. sublamellatus (Nevill, MS.) var. n. — Preston (1912: 305). Lamellidens (s.s.) marginalis var. thwaitesi (Lea). — Preston (1912: 303). Lamellidens (s.s.) marginalis var. tricolor (Hanley and Theobald). — Preston (1912: 303). Lamellidens (s.s.) marginalis var. zonatus (Deshayes). — Preston (1912: 305). Lamellidens (s.s.) narainporensis sp. n. — Preston (1912: 305). Lamellidens (s.s.) nongyangensis sp. n. — Preston (1912: 306). Lamellidens (s.s.) phenchooganjensis sp. n. — Preston (1912: 306). Lepidodesma languilati (Heude, 1874). — Preston (1912: 281). Margaritana margaritifera (Linnaeus). — Preston (1912: 285). Nodularia (Lanceolaria) oxyrynchus [sic] (Mart.). — Preston (1912: 288). Nodularia (Radiatula) crispisulcata (Benson). — Preston (1912: 293). Nodularia (Radiatula) lima Simpson. — Preston (1912: 293). Nodularia (Radiatula) lima var. siliguriensis Preston. — Preston (1912: 293). Nodularia (s.s.) andersoniana (Nevill). — Preston (1912: 291). Nodularia (s.s.) bonneaudi (Eydoux). — Preston (1912: 290). Nodularia (s.s.) caerulea (Lea). — Preston (1912: 288). Nodularia (s.s.) caerulea var. gaudichaudi (Eydoux). — Preston (1912: 289). Nodularia (s.s.) caerulea var. keraudreni (Eydoux). — Preston (1912: 289). Nodularia (s.s.) chaudhurii sp. n. — Preston (1912: 290). Nodularia (s.s.) crispata (Gould). — Preston (1912: 291). Nodularia (s.s.) douglasiae (Gray). — Preston (1912: 288). Nodularia (s.s.) douglasiae var. shanghaiensis Lea. — Preston (1912: 288). Nodularia (s.s.) ingallsiana (Lea). — Preston (1912: 291). Nodularia (s.s.) involuta (Benson). — Preston (1912: 293). Nodularia (s.s.) nuttalliana (Lea). — Preston (1912: 293). Nodularia (s.s.) occata (Lea). — Preston (1912: 289). Nodularia (s.s.) olivaria (Lea). — Preston (1912: 292). Nodularia (s.s.) pachysoma (Benson). — Preston (1912: 290). Nodularia (s.s.) pazii (Lea). — Preston (1912: 291). Nodularia (s.s.) pecten sp. n. — Preston (1912: 292). Nodularia (s.s.) pugio (Benson). — Preston (1912: 291). Nodularia (s.s.) scobina (Hanley). — Preston (1912: 291). Nodularia (s.s.) shurtleffiana (Lea). — Preston (1912: 289). Nodularia (s.s.) theobaldi (Nevill, MS.), sp. n. — Preston (1912: 292). Parreysia (s.s.) annandalei sp. n. — Preston (1912: 302). Parreysia (s.s.) bhamoensis (Theobald). — Preston (1912: 299). Parreysia (s.s.) burmanus (Blanford). — Preston (1912: 301). Parreysia (s.s.) corbis (Hanley). — Preston (1912: 301). Parreysia (s.s.) corrugata (Müller). — Preston (1912: 297). Parreysia (s.s.) corrugata var. fragilis Hanley & Theobald,. — Preston (1912: 297). Parreysia (s.s.) corrugata var. laevirostris (Benson). — Preston (1912: 297). Parreysia (s.s.) corrugata var. nagpoorensis (Lea). — Preston (1912: 298). Parreysia (s.s.) daccaensis sp. n. — Preston (1912: 300). Parreysia (s.s.) favidens (Benson). — Preston (1912: 298). Parreysia (s.s.) favidens var. assamensis (Nevill, MS.), var. n. — Preston (1912: 299). Parreysia (s.s.) favidens var. chrysis (Benson). — Preston (1912: 299). Parreysia (s.s.) favidens var. deltae (Benson). — Preston (1912: 299). Parreysia (s.s.) favidens var. irridula [sic] (Benson). — Preston (1912: 299). Parreysia (s.s.) favidens var. pinax (Benson). — Preston (1912: 299). Parreysia (s.s.) favidens var. plagiosoma (Benson). — Preston (1912: 299). Parreysia (s.s.) feddeni (Theobald). — Preston (1912: 300). Parreysia (s.s.) gowhattensis (Theobald). — Preston (1912: 301). Parreysia (s.s.) perconvexa sp. n. — Preston (1912: 302). Parreysia (s.s.) pernodulosa sp. n. — Preston (1912: 300). Parreysia (s.s.) rajahensis (Lea). — Preston (1912: 301). Parreysia (s.s.) sikkimensis (Lea). — Preston (1912: 301). Parreysia (s.s.) smaragdites (Benson). — Preston (1912: 299). Parreysia (s.s.) tavoyensis (Gould). — Preston (1912: 300). Parreysia (s.s.) tavoyensis var. triembolus (Benson). — Preston (1912: 301). Parreysia (s.s.) wynegungaensis (Lea). — Preston (1912: 298). Physunio (s.s.) gravidus (Lea). — Preston (1912: 293). Physunio (s.s.) micropterus (Morelet). — Preston (1912: 294). Pilsbryoconcha exilis (Lea). — Preston (1912: 282). Pseudodon (s.s.) ava (Theobald). — Preston (1912: 296). Pseudodon (s.s.) cambodjensis (Petit). — Preston (1912: 296). Pseudodon (s.s.) cumingii (Lea). — Preston (1912: 296). Pseudodon (s.s.) inoscularis (Gould). — Preston (1912: 296). Pseudodon (s.s.) salwenianus (Gould). — Preston (1912: 296). Pseudodon (s.s.) tumidus (Morelet). — Preston (1912: 296). Pseudodon (s.s.) vondembuschiana (Lea). — Preston (1912: 295). Pseudodon (Trigonodon) crebristriatus (Anthony). — Preston (1912: 295). Pseudodon (Trigonodon) crebristriatus var. curvata var. n. — Preston (1912: 295). Pseudodon (Trigonodon) crebristriatus var. peguensis (Anthony). — Preston (1912: 295). Shistodesmus [sic] lampreyanus (Baird & Adams). — Preston (1912: 287). Solenaia soleniformis (Benson). — Preston (1912: 285). Trapezoideus exolescens (Gould). — Preston (1912: 307). Trapezoideus foliaceus (Gould). — Preston (1912: 307). Trapezoideus foliaceus var. zayleymanensis (Nevill, MS.), var. n. — Preston (1912: 307). Trapezoideus misellus (Morelet). — Preston (1912: 307). Trapezoideus misellus var. subclathratus von Martens. — Preston (1912: 307). 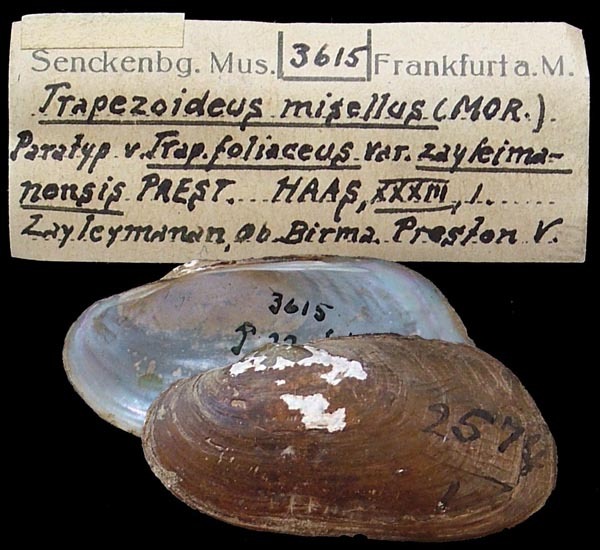 Trapezoideus pallegoixi (Sowerby). — Preston (1912: 307). Unio ascia Hanley, 1856. — Preston (1912: 287). Unio modiola sp. n. — Preston (1912: 286). Unio mongolicus Middendorff, 1851. — Preston (1912: 287). Unio mussolianus Küster, 1861. — Preston (1912: 286). Unio perakensis sp. n. — Preston (1912: 287). Unio terminalis Bourguignat, 1852. — Preston (1912: 287). Unio tigridis Bourguignat, 1852. — Preston (1912: 287).